This is a historian's history book. Part one is devoted to historiography; the first chapter gives a critical overview of revolution theory, looking at the hypotheses and defects of various paradigms, frames of reference that might be fruitful for the analysis of change in government, in regime and/or society effected by the means of violence (one definition of revolution). 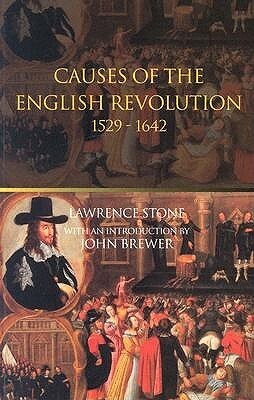 The second chapter gives a revealing account of an acrimonious historians' spat of the post-war years regarding the English Revolution: once it was realised that neither the Victorian political narrative nor the Marxist clear-cut conflict between bourgeoisie and decaying feudal classes would really do for the seventeenth century, and the social aspect as well as the political and religious entered the arena, there was rather a lot of wild speculation with not a lot of hard evidence. Stone is very frank about his own role in this dispute, admitting mistakes, but also licking his wounds and quite prepared to place the well-aimed shot in retaliation. Not everyone may necessarily be fascinated by somewhat arcane academic infighting, but this part is only 40 pages. Part 2 does start with a little bit of theory again, but only enough to justify calling the events of 1640-1642 a revolution. Admittedly there was only modest and limited social change, but it cannot be denied that the King was beheaded, and not merely to be replaced by someone more popular: he was put on trial in the name of the people of England, on a charge of high treason: violation of the 'fundamental constitutions of this kingdom'. The House of Lords was abolished, along with some legal institutions, and the Established Church was virtually swept away, episcopal properties seized.Stone organizes his analysis into three categories; long-term pre-conditions, medium-term precipitants and short-term triggers. The other organizing principle for him is the idea of relative deprivation; the idea that frustration arises when people have enjoyed a period of growth and progress which then takes a downturn, so that their expectations streak ahead of perceived reality. This works equally well for privilege and social status as for economic prosperity, and is obviously a factor in his analysis of the prevarication and weakness of the reign of Elizabeth as one of the elements in long-term structural instability, in that it made the task of the Stuart kings much trickier: there was a lot of political ground lost for the monarchy, and religious dissent ignored or swept under the carpet and yet at the same time her reign was idealized as the Golden Age of Good Queen Bess. I did like the idea of a multi-causal approach, as anything else is bound to be one-sided, but the problem lies in marshalling the material into some kind of manageable form, and although the idea of the different time-lines was helpful, it is nevertheless insufficient to really clear a path through the jungle of the various gradations of upper and lower gentry, grandees, courtiers, yeomen, aristocrats, county/parish gentry and the wealth of other categorisations, some of them economic, some of them social. This is probably par for the course, as there is little clear-cut structure in how these differing categories fall along Royalist or Parliamentarian lines. One little factlet that did really stick in my mind was the question of age. I've read a fair bit recently about the French Revolution, and especially in the Mantel novel it struck me again and again how young the revolutionary leaders were, Danton and Robespierre only in their early thirties when they were executed. An interesting cross-section of the Lower House in 1642 shows that M.P.s in their twenties were Royalist rather than Parliamentarian by a factor of 2 to 1, and conversely, M.P.s in their fifties were Parliamentarians rather than Royalist by a factor of 2 to 1. The older men were radical, the younger conservative. Odd and strangely puzzling, but indicative of how Stone uses statistical data to explode prevailing myths.BTW, goodreads has the title wrong: mine is called 'Causes of the English Revolution'. I don't get the impression that Lawrence Stone was overly modest, but he was certainly not so arrogant as to claim he had made the definitive list. Questo di Stone è il primo saggio che negli anni '70 cercò di fare un po' d'ordine in quella questione un po' spinosa che è la Rivoluzione Inglese, un avvenimento talmente complesso da non essere stato ritenuto per lungo tempo neppure una vera e propria rivoluzione ma solo una serie di scontri inseriti nel contesto più ampio della guerra dei Tre regni.Stone, uno dei primi storici a capire l'importanza delle nuove scienze sociali e antropologiche nel lavoro dello storico per comprendere le trasformazioni del mondo, fa una lunga digressione sugli strumenti che lo storico può prendere in prestito dai sociologi per cercare di dipanare al meglio delle sue capacità l'intricato intreccio di cause a lungo, medio e breve termine che hanno portato nel 1642 a una ribellione contro i tre pilastri fondanti di un paese di lunga tradizione conservatrice come l'Inghilterra: il re, la Chiesa e i Lords.Molto viene detto a riguardo di Chalmers Johnson, sociologo degli anni '40 a cui deve tutta l'impostazione di questo volume e gran parte delle sue analisi. Segue un breve excursus del dibattito storiografico fino a quel momento, perchè Stone, professore e storico, non dimentica(va) mai di ricordare a chi legge (principalmente suoi studenti) che la storiografia è lungi dall'essere immobile, e che bisogna essere sempre consapevoli di tutto ciò che è stato scritto fino a quel momento senza lasciarsi inibire dai cosiddetti professoroni.Anche loro possono sbagliare.Stone compreso.La lunga introduzione in effetti può risultare un ostacolo difficile da digerire per chi non ha interesse nella storiografia, penalizzando il godimento di un libricino ottimo, impostato con lo stile semplice e scorrevole che caratterizza l'ormai defunto Stone e che me lo fa sempre apprezzare molto come studioso.In più il libro è molto breve e deve per forza dare molto per scontato, quindi non lo consiglierei se non si ha una conoscenza un pelo più approfondita di quella che viene fornita al liceo. Consiglio anche di leggere prima "La crisi dell'Aristocrazia", saggio decisamente più lungo e completo che permette di fare mente locale sulle profonde trasformazioni sociali, economiche e religiose che hanno attraversato il paese dal Regno di Elisabetta all'arrivo di Cromwell. As the author writes, referring to a portion of this methodical and structured presentation, "The essential thrust of this historical analysis has been to stress the interconnection of forces and events, to demonstrate the way everything affects, and is affected by, everything else." Historiographically important explanation of the social causes of the English Revolution. establishment historian with distrust of leftist narratives. still has its uses. Excellent brief account of the English Revolution. Quite a surprising emphasis on the exact nature of its revolutionary violence. Pretty heavy on the theory. Lawrence Stone - Lawrence Stone was an English historian of early modern Britain. He is noted for his work on the English Civil War and marriage. Stone was a major advocate of using the methods of the social sciences to study history.